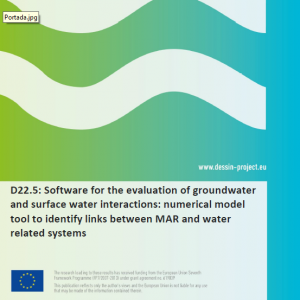 This deliverable reports the results of the numerical model developed to evaluate the impact of MAR in general, and ASR in particular, on identified ecosystem services. This numerical model has two main objectives: to evaluate the interactions between groundwater and surface water media and to become a tool to show the benefits of this technology to implementers. The first objective is approached simulating a typical deltaic aquifer and evaluating the results of different MAR configurations. The latter is done through a web page with the results of the transient simulation in video format. This report is considered supporting material to provide background information about development and application of this software deliverable.